I have been awarded an Ontario Arts Council Visual Artists Creation Projects Grant for the creation of new paintings titled Transiterations. This grant will allow me to explore an abstract painting language to express my experience of migration from India to Canada using bolts of coloured fabric as a metaphor for transition. Thank you, OAC! I have just returned from Distributed Identities, a 5-week thematic residency led by artists Deanna Bowen and Brendan Fernandes at the Banff Centre for Arts and Creativity in Banff, Alberta. My residency was supported by the Canada Council and the Banff Centre. It was a remarkable time of experimenting with new mediums and ideas that are sure to have a lasting impact on my practice. During my time there, I worked with the elements—the snow, ice, below-zero temperatures— and saris to consider the ways in which climate and landscape impact upon a migration journey to Canada. You can find work-in=process images and thoughts on my time at Banff on my Instagram feed. Thank you to the Canada Council, the Banff Centre and the facilitators, colleagues and staff for an incredible experience nestled in the Canadian Rockies and the land of the Stoney Nakoda, Blackfoot, and Tsuut’ina Nations. I am thrilled to share the news that the Canada Council for the Arts, Canada’s national arts funding body, has awarded my work-in-progress project, Outerwhere, a major Research and Creation grant. Outerwhere is currently in production is a series of fibre-based, sculptural installations of embellished second-hand winter coats. Combining found objects: old winter coats from Canada; small trinkets, objects, food wrappers, plastic flowers, fabric ribbons, mirrors and bells from India, fabric swatches, conductive yarns, and small sound players, Outerwhere will explore the binaries of inside/outside, personal/public, past/present as they relate to material culture, climate and the migratory experiences of South-Asian-Canadians. With this grant, I am able to expand this project and explore new material inclusion into the coat linings. You can see some images of the process so far on Instagram under the hashtag #outerwhereseries. I am honoured and delighted to be one of two recipients of the 2018 Melissa Levin Emerging Artist Award juried by the Textile Museum of Canada. This museum is a favourite of mine and with this award, I will be researching their collection of South Asian garments, textiles and fibre collections. Stay tuned for a public presentation on my work at the museum in Spring 2019 alongside Catherine Blackburn, the other recipient of this award. The Textile Museum of Canada is pleased to announce the winners of the 2018 Melissa Levin Emerging Artist Award - Catherine Blackburn and Meera Sethi. The Textile Museum of Canada is the only museum in Canada that explores ideas and builds cultural understanding through the universally relevant media of textiles. Located in the heart of downtown Toronto, the Museum’s permanent collection spans nearly 2,000 years and consists of more than 15,000 artifacts. The Textile Museum of Canada is a non-profit cultural and internationally renowned educational institution, which marked its 40th anniversary in 2015. A leader in the digitization of collections and interactive environments, the Museum has been recognized the world over for innovation in the development of landmark educational, research, and creative initiatives. Open seven days a week, the Museum is located steps from the St. Patrick subway station and just a few blocks from Toronto City Hall and the Art Gallery of Ontario. The Museum Shop specializes in textile related merchandise including books and toys and globally sourced artist-designed and artist-made products such as scarves and jewelry. More information about the Museum and its exhibitions can be found online at textilemuseum.ca. For more information, please see the full press release. I am thrilled to share that my painting Poonam Aunty from the Upping the Aunty series has won first place in the Quest Art 2018 TD Thor Wealth Management Art Prize! It was an honour to be selected for this work in particular. Read more about the prize. The work will be up as part of a two-month prize exhibition at Quest Art in Midland, Ontario, Canada. Please join me for a solo exhibition of my new series of paintings: BEGUM from November 23 - November 29, 2017 at The Freedom Factory in Toronto. The venue is partially accessible. Please see details on the Facebook event page. Music by DJ Zehra. Performances by Hasheel. 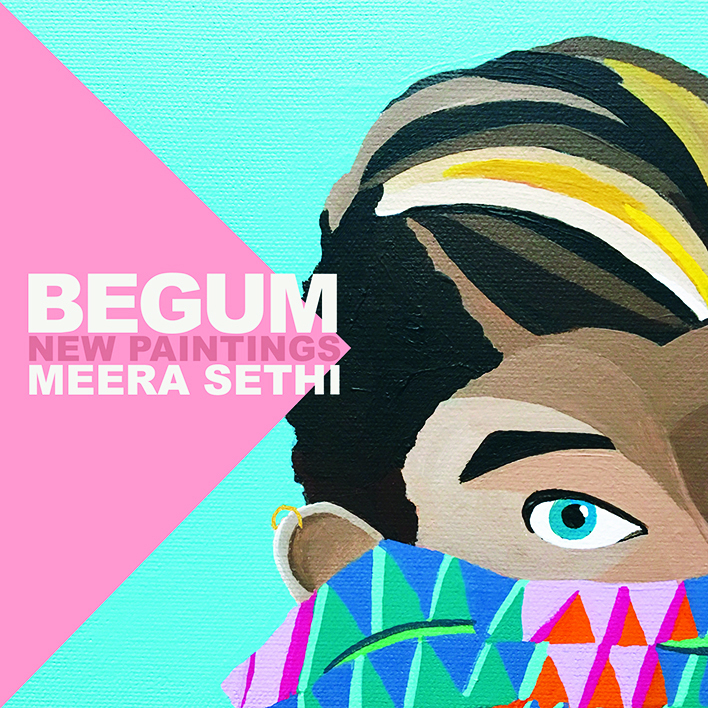 BEGUM (Hindi for "queen") is a new series of paintings celebrating queer masculinities through an exploration of mixed media embellishments on canvas. This exhibition is made possible with the assistance of an Ontario Arts Council Exhibition Assistance Grant. Thank you OAC! Ramvati Aunty from Upping the Aunty, my recent series of painting, has been acquired by the Royal Ontario Museum as a part of their permanent collection. This is a remarkable occasion for me as it is the first time my work is part of a public collection in Canada. For ROM Senior Curator, Dr. Deepali Dewan, Ramvati Aunty engages in visual dialogue with other aspects of the ROM collection, especially original embellished Ravi Varma lithographs from the early 20th century, and may be displayed alongside them at a future time. These very lithographs inspired the Upping The Aunty series, making this an interesting pairing. On November 16, 2016 I was invited to participate in a public conversation at New York University entitled “Fashion Diaspora” with artist Ayqa Khan, academic and author of Fashioning Diaspora: Beauty, Feminity, and South Asia American Culture (Temple UP, 2016) Vanita Reddy, academic Sharon Heijin Lee, academic and author of The Beautiful Generation: Asian Americans and the Cultural Economy of Fashion (Duke UP, 2011)Thuy Linh Tu, and myself. It was an engaging post-Trump evening of sharing artwork, research and ideas on the ways in which we can look to fashion as a way of understanding diaspora. We had a full house and a lively discussion. You can watch a recording of the entire evenings proceedings and see photos from the event. A very special thank you to The Asian/Pacific/American Institute at NYU for the opportunity to share my work in New York. Gold, silver, nickel and coins of various other metals have been a regular feature of Diwali for me. Even the humble penny. As a child celebrating Diwali I remember following a ritual laid out by my father that I little understood: washing all the coins in the prayer plate, annointing them with milk and red sandoor. It was an offering to Laxmi, the Goddess of prosperity. I continue this today, however this year I have had the privilege of designing a 1oz. gold coin for the Royal Canadian Mint. Inspired by Rangoli designs, this Limited Edition coin is available online from the Royal Canadian Mint where you can also read about the symbolism. Click on the hand to reveal the numismatic coin!